If you've seen Wilger's nozzle bodies, you probably noticed pretty quick they come in all shapes and sizes. Given the diverse applications out there, there really is a need to be able to perform each task with the right tools. A lot of the time, the right tools don't exist with single nozzle bodies. Be it having too much flow on your fungicide going out of one tip, which results in large droplets. Combo-Rate bodies stack so that you can split up the flow into whichever tips provide the best droplets for your application. Be it trying to be as productive as you can by switching rates from inside the cab by using the Combo-Rate air-on modules. Literally having seven flow rate options from having three stacked bodies with air modules, to which you choose what you want sprayed from a switch in your cab. Lots of pretty cool stuff tailored to whatever situation you need that better tool for. 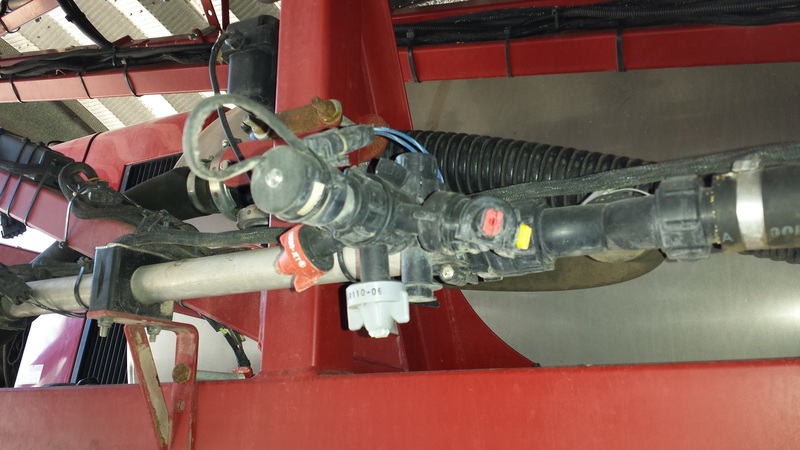 For any questions, or if you have a specific sprayer flow or nozzle question, I can help you out whether it is a self-propelled 150 ft sprayer to your yard sprayer or even setting up a 'dry boom' spray system for watering your garden. Last edited by WilgerIndustries; 03-17-2015 at 12:32 PM. I'm using this product as a liquid fertilizer manifold on my seeding drill. The issue I'm having is sometimes the U shaped pins that hold the bodies together start to work their way out. If not caught in time the connection will leak. Is there a trick to keeping these pins in place? Typically, the best way to keep them installed is to have them literally just pushed through all the way. The design of the u-clip (angles/lengths) are made so that as the vibration of the seeder(or sprayer) will make the u-clip try dig itself in deeper. As to what might be causing your issue, it might be the u-clip itself is out of spec. We have a company that does the bending/forming of the u-clips, and it is possible they were a bit looser, so they won't force themselves in with jiggling/vibration. Easiest(cheapest) fix would just to replace those u-clips with new ones. Also, another trick to getting to putting them in (can't see if you have enough room in your picture, so bear with me), but if you are having difficulty getting them through both holes, you can use two u-clips. With the first, just put it in the two holes on one side. With the other, slide it through the other side until you poke the first set out. Honestly, I took a look at your picture and it seems like you are pretty darn close to that frame. All in all, the u-clips aren't designed to fall out unless you pull them out, so its probably worth just replacing the bunch of them for a few bucks. Nice setup though. For those who aren't familiar, he is using Combo-Rate through-bodies manifolded together. 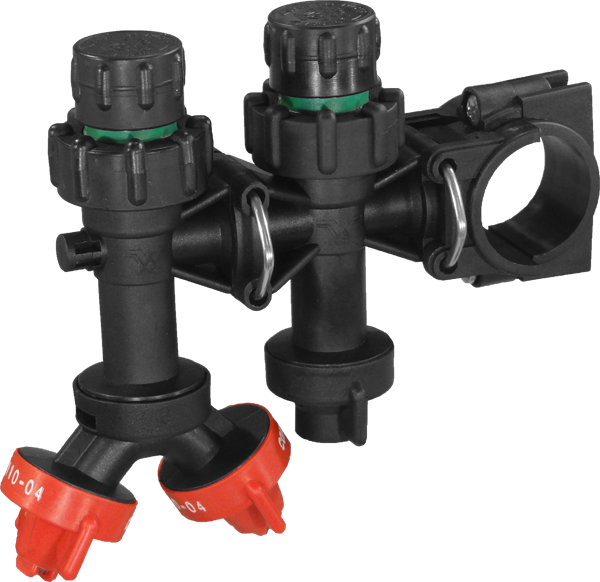 Each body has a low PSI diaphragm check valve (4PSI). Each of the hoses are just attached to hose barb caps. 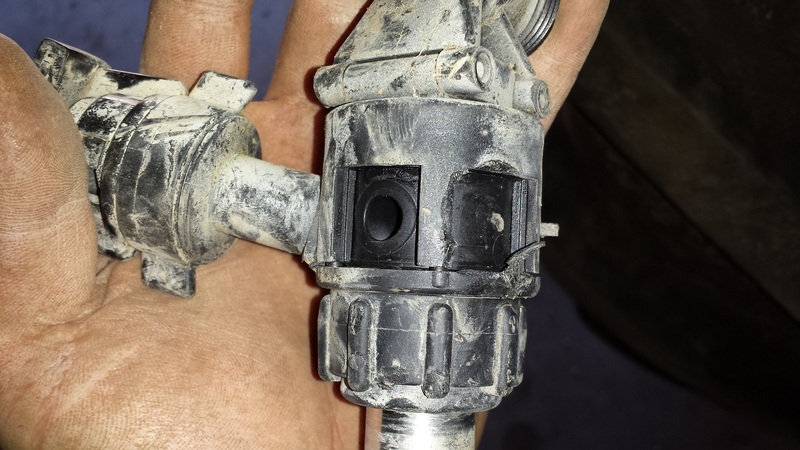 For the hook-up from the filter, it looks as though he has it setup for a 'one-way' saddle to each side of the manifold. 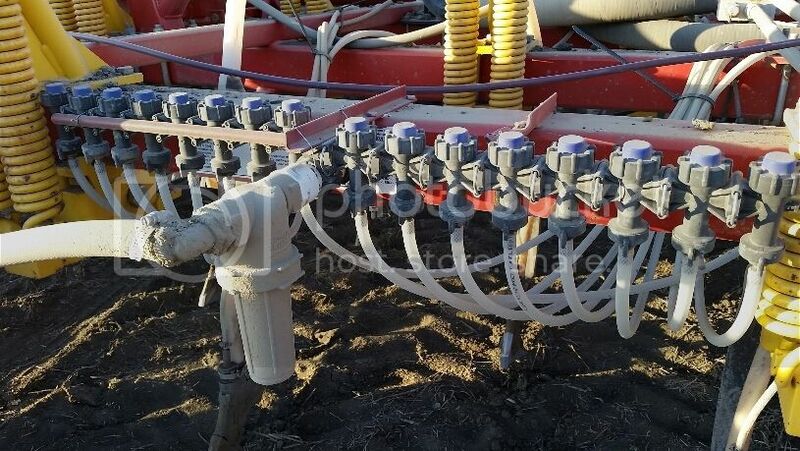 A few ways you could change it from using u-clips, give you are pretty much just needing the manifold to stay still and not really stick out of the boom. You'd just use bolts to go through the holes, and through the back. For hooking up the manifold to the frame, you can then just have the set of manifolds bolted to another plate. Means no u-clips at all, and if you ever did need any maintenance to take the manifold off for some time, its all on one plate. Also, its not too clear in the picture, but if you were using two one-way saddles for your flow, you could switch it up with a two-way saddle. If you were worried about pressure drop, you could even up the size of the saddle to a 9/16" inlet. (Guessing you aren't doing crazy volumes applying with your seeder in either case). Haha, I gotta say, that's some pretty good carnage. I am looking for tips for fungicide in corn using the Dual body with PinPoint on a New Holland SP333 (Miller 5333). The boom is on 15" spacing. Using the Combo Jet tip selector at 20 gpa and a maximum speed of 14 mph I get a tip recommendation of DR 110-04 for the BPM body at 0.49 gpm and 412 VMD. Now the flow through body is giving me trouble. The chart recommends a tip with a VMD of 280 and a flow of 0.24 gpm and the closest I can get to that is with a MR 80-02 (262 VMD and 0.24 gpm) Would it be fine using a 80 degree tip in one body and a 110 in the other? Or should I go with a MR 110-02 with a 235 VMD at 0.24 gpm? Sorry about the slow response. Just catching up from getting back from Germany (Agritechnica), so just putting out fires. 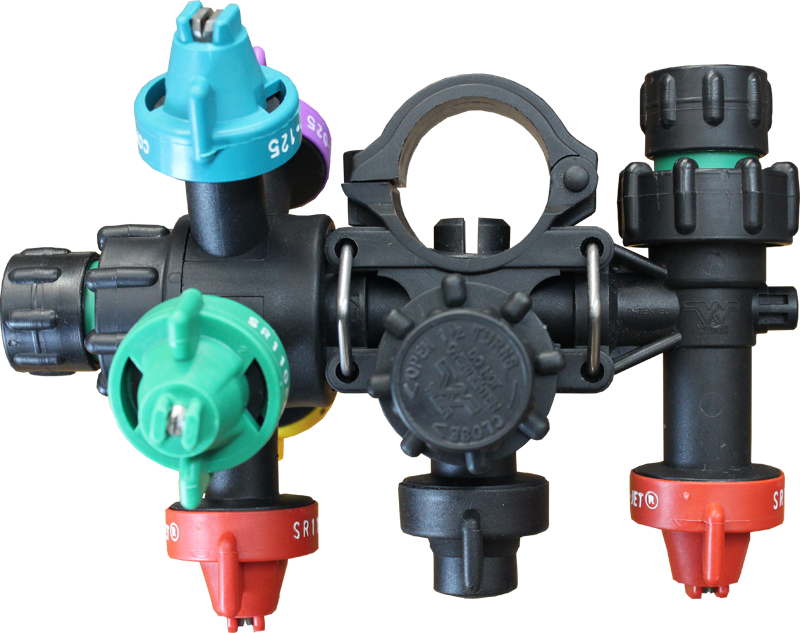 For splitting up the flow using the wye adapter, it is fairly similar to what you are trying to do with the one BPW and one standard spray tip, but both will maintain the benefit of BPW systems. Since you have closer spacing, the actual volume out of each tip is lessened a bit. For BPW dual tip application, just remember both tips will be needing to be compatible in their duty cycle range (so make sure one tip isn't running outside of it's operating speed range) and remember both tips will be seeing the same pressures. To make it easy for tip selection, you can literally split the flow in half for an application like this. 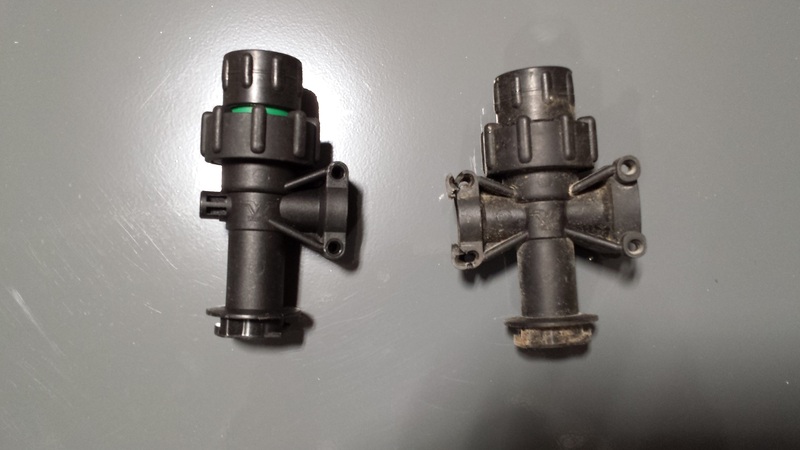 From what testing has shown (both in lab and in crop), the front tip on a dual tip application (either split by wye adapter or by two nozzles going straight down) does a little more of the work than the back tip. Again, most of the results of testing showed it might have done something like 55% of the application versus the back tip at 45%. It's significant, but not to pull hair out stressing over. So, best even look up splitting the flow up in half (so 10US GPA @ 14MPH). For a flow rate, that'd end up suggesting using either a -04 (red) tip at pressures ranging from 35-70PSI, or a -05 (brown) at a more versatile pressure/speed range. Given you are looking for fungicide tips, depending on your typical spraying conditions (i.e. windy, close to drift sensitive areas, etc), you could likely strive for a finer VMD than 400 microns. Again, this is more of a generality for fungicide, as most chemicals require a full coverage on most parts of the plant. So, if you were looking for something even around the 300 micron range, something like running a mix of MR 110-04/SR110-04 around the 60PSI, or running a MR 110-05/SR 110-05 around the 40-50PSI for a good mix of small/coarser droplets. Typically for best results, it seems like having the coarser tip facing forwards. By all means if you did have some -04 tips on hand already, you could definitely use those at the same time as the -05s as well (i.e. a MR110-04 as well as an SR 110-05), you would just maintain you speed range within the MR110-04's bounds) and have your 20GPA set on your computer. This past year I used a GreenLeaf DF08 for corn fungicide at 20 gpa. I am thinking that in a crop like corn I don't want an angled tip, I want to get as much spray down in the canopy as possible. The angled tips are great at covering a wheat head or the corn tassle but I want better coverage lower. We know higher pressure does not equal better penetration, better coverage yes but not better penetration. This is where I think the dual nozzles facing down would work the best, one finer for coverage and one coarser for penetration. That's why I liked the Combo Jet Dual Body tip selector chart, it was able to compensate for the different flows through the tips and keep me in line with the speed I'm running. As for other concerns such as drift and wind, it is a fungicide so drift isn't a huge problem. I know with the Greenleaf tips pointing backward with the boom up over the corn wasn't nice on a real windy day. I have a rear boom but you couldn't tell that day. That's another reason I'm looking for two downward facing tips. That's was my question for you, basically to see if I was going about things right and a recommendation on nozzles if the VMD is very important on the chart for fungicide. I'm thinking with the 15 inch spacing a 80 degree tip will probably work just as well as a 110 in a corn fungicide application but not sure if it will still work in say a aphid situation in beans. I would likely go back to the DF08 for that or a TTJ but it's nice to have options if you already have the tips. Understood. That makes a lot more sense. I was thinking more of just covering the basics of it as a general all around application, but seems like you've done your homework in this. Haha. So, given you know exactly what you are trying to achieve, I'll answer your question head on. Overall the 80 degree tips, if sprayed at the typical heights as you might be spraying with the rest of your 110° tips, would not give you 100% overlap. Not a huge issue, as you spraying into post-emergent corn, and the tip spacing would do more for your overlap/coverage than a wide angled spray tip. Since you are on 15" spacing, I think this would be a reasonable trade-off for your corn. On your aphids in beans, I'd suggest staying at 110° all the way through and trying to stay closer to the ground. So, for your tip selection, based on your input flow rate for your tips, it might be easier to select the tips separately through tip wizard, breaking down the distribution of flow between the two tips with the assumption the front tip is still doing most of the heavy work. For example, if we are wanting to apply with your 14MPH, 15" spacing, 20GPA. Assuming you'd still want something like 2/3 of the volume going out of your BPW/PWM nozzle, then simply split up the application rates by that same amount. This would make it simpler in that you'd have to pick two tips that just operate at the same pressures/speeds, just for different flow rates. So, splitting the 20GPA into 13.5 GPA and 6.5 GPA, we'll entrust the 13.5GPA tip to the BPW system, and the finer tip to the standard auto-rate controlled nozzle body. On the duty cycle side of things, it's not too bad. (Usually I'll recommend closer to 70% to give you more leeway in your turn compensation through Pinpoint) Realistically though, as you'd need to slow down somewhat to turn, and you want to retain your BPW as well as your standard tips' pattern, that is a good spot to sit. For the 6.5 GPA tip that will be running off of your auto-rate controller, we need to have it match up within that same speed range. MR 80-02 @ 50PSI with a VMD of 254, while going 14MPH. Given that is what you had found out yourself, kudos to that. Haha. From that result, I might delve into something that a lot of people don't think about, or even know about. 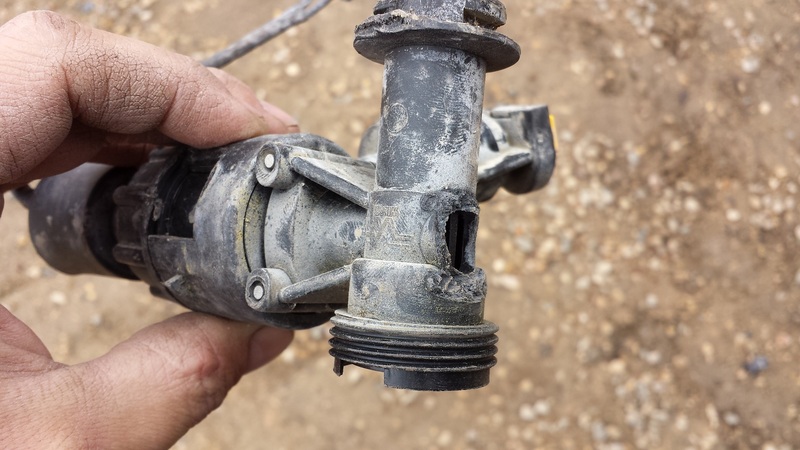 With all sprayers, there is pressure drop that comes from the plumbing setup and the tips. 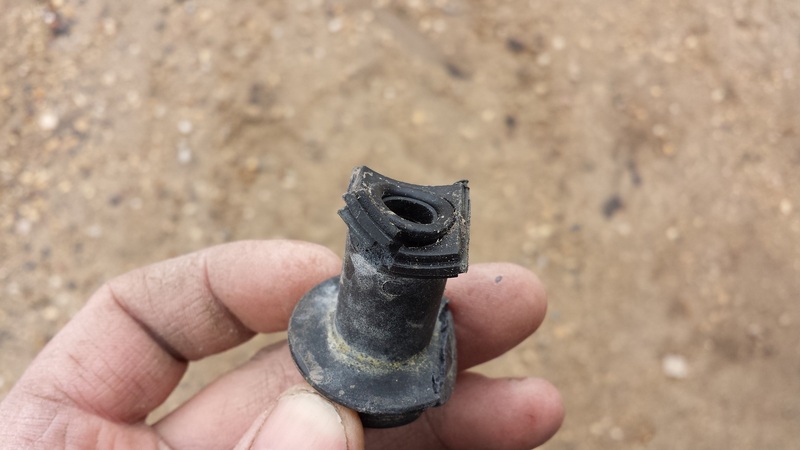 What I am getting at is that your velocity leaving the tip will be greater with tips that have less pressure drop. Take it for what it is, but if maintaining that velocity leaving the tip is something you were wanting to accomplish, using a 'finer' tip would afford you more velocity leaving the tip. So, going from an MR80-02 to an SR80-02 would mean more velocity (but more driftable fines as well - which is a trade off you'd have to choose from). All in all, I think you are at the right spot. Note that the DR110-04 might be a little undersized for your speeds and rates, but other than that, you have the right idea. As far as the overall VMD recommendation for the tips, best try align yourself to the chemical/label droplet size category and then work from there based on your spraying conditions (i.e. wind alley, decent cover all the time, etc.). I'm not sure where you had gotten the 400VMD and 280VMD from, but just make sure it is suited to what your needs are. Does that clear anything else up? I hate to answer questions that aren't being asked, so definitely let me know. There's just so much extra information out there, that its easy to get sidetracked.